A moss SPORE germinates and develops into a green mass of thin threads called the PROTONEMA. The protonema, a phase in the gametophyte stage of the life cycle, resembles a filamentous green alga. 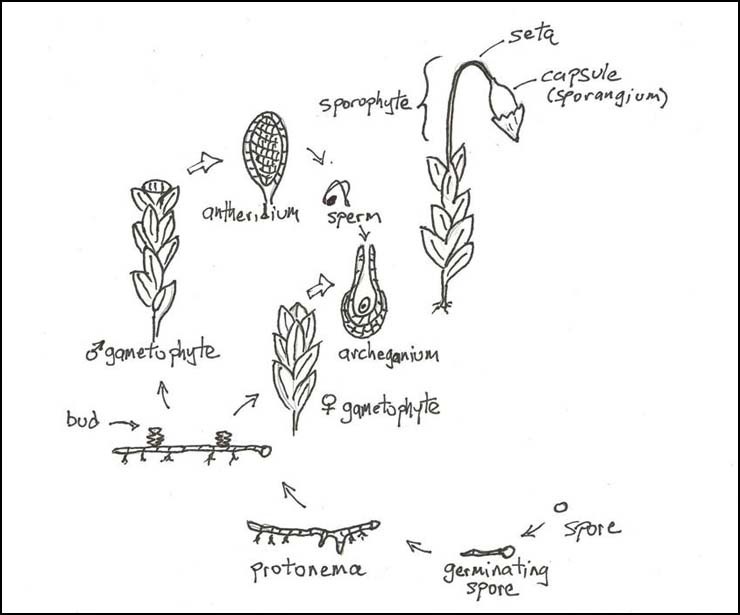 Note: The moss life cycle figures here are redrawn with slight modification from A Laboratory Manual for Botany by Margaret Balbach and Lawrence Bliss (2002). 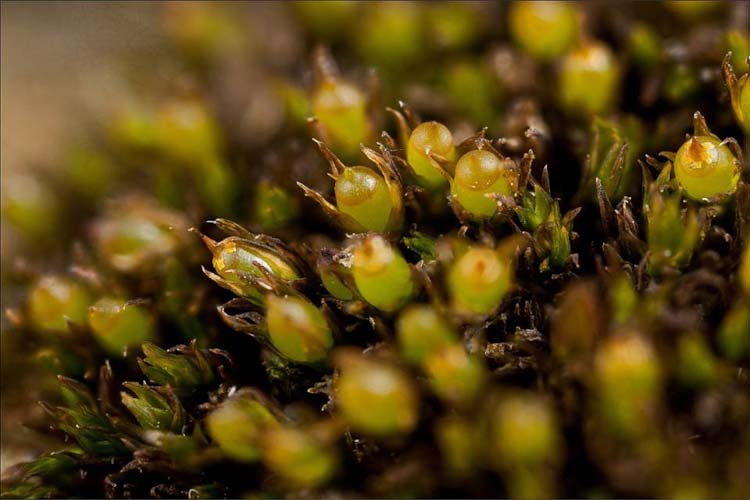 Below, see the protonema of a quick-growing, short-lived little cushion moss (acrocarp) of open sites, Physcomitrium pyriforme, with the leafy phase of the gametophyte just starting to spring forth from it. 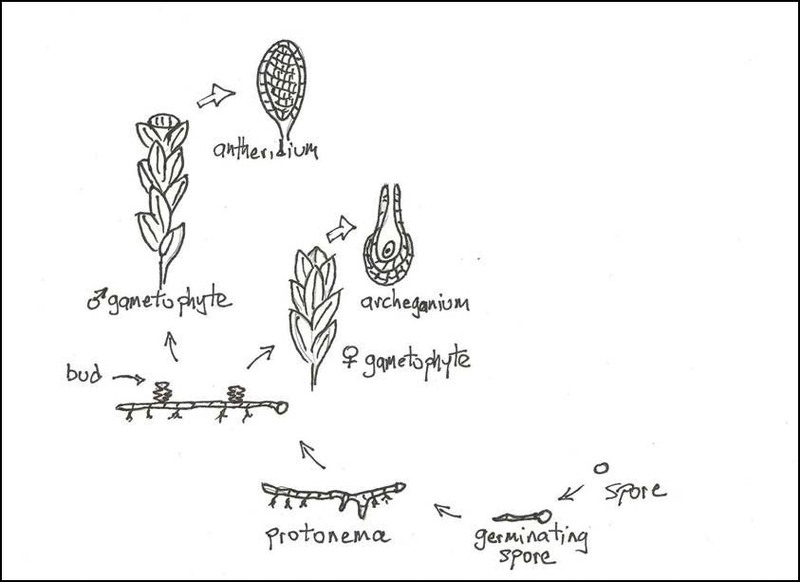 A moss protonema is the threadlike early form of the gametophyte stage of the life cycle. 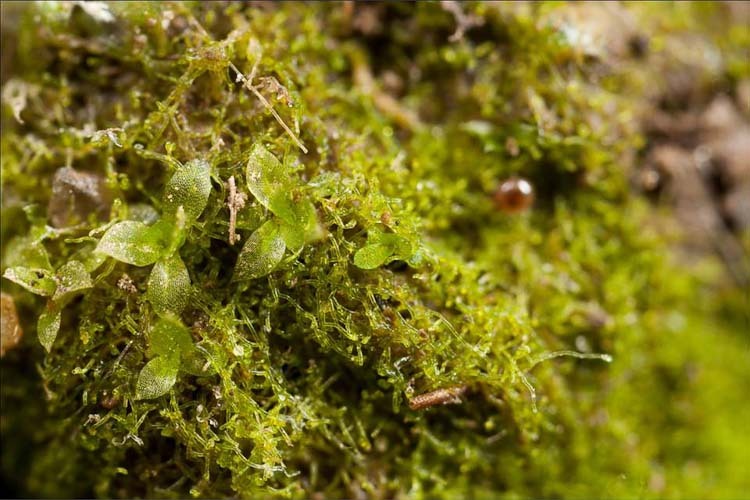 Many mosses, much of the time, are present only as gametophytes, and may be identified on the bases of gametophytic features alone. 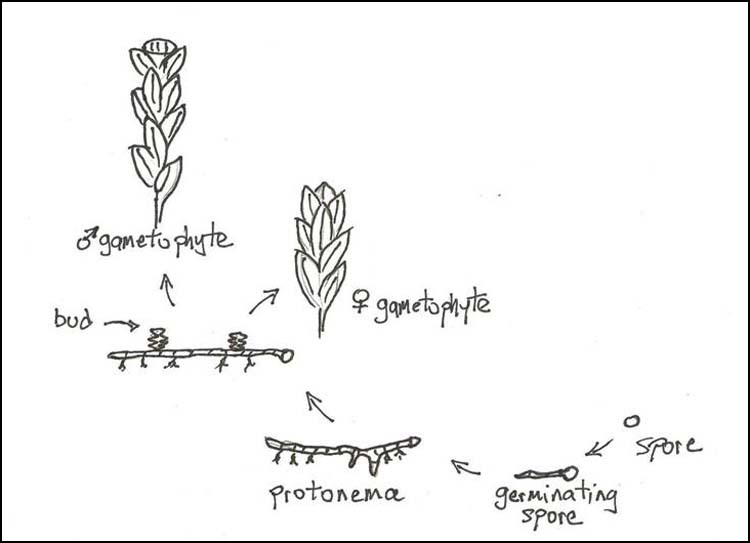 Here are some example of moss gametophytes. Campylium chrysophyllum is a carpet moss that is common on the ground in open woods. Note the widely spreading leaves. 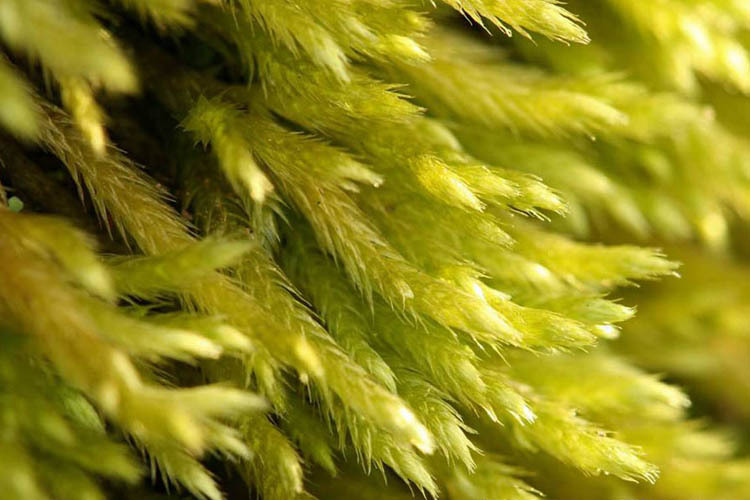 Campylium is a carpet moss (pleurocarp) with wide-spreading leaves. Gametophytes of the closely related cushion moss genera Mnium and Plagiomnium have fairly broad leaves. Gametophytes of two cushion mosses (acrocarps). Left: Mnium hornum. Right: Plagiomnium ciliare. The carpet moss genus Brachythecium is often seen without sporophytes, making identification difficult. Brachythecium is a common genus of mainly woodland carpet mosses (pleuropcarps). 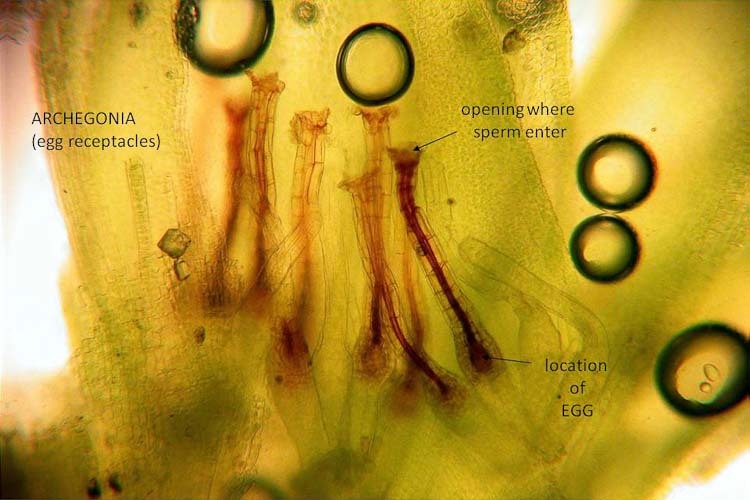 At the ends of some branches of sexually reproducing mosses, clusters of tiny GAMETANGIA (gamete-producing structures) develop, over-topped or encircled by the surrounding uppermost leaves. The male (sperm-producing) gametangia are tiny sac-like structures called ANTHERIDIA, each of which produces many SPERM. The female ARCHEGONIA are tiny and flask-shaped with an opening at the top for sperm to enter and a single EGG inside, down at the bottom. There’s a little brick wall in front of a residence in Columbus upon which grow two mosses of somewhat similar overall form that nonetheless reproduce in essentially manners. Orthotrichum pumilum (left side of the photo below) is sexual, with gametangia, gametes, sporophytes and spores, whereas (right side of photo) Syntrichia papillosa is wholly asexual, reproducing only by means of small easily detached spherical gemmae covering the middle portions of most leaves. Two mosses on a wall. Left: Orthotrichum pumilum. Right: Syntrichia papillosa. Examination of the tips of the sexually reproducing Orthotrichum through a compound microscope at 100X early in March revealed gametangia. Antherida are male gametangia –cylindric sacs within which sperm are produced by mitosis. 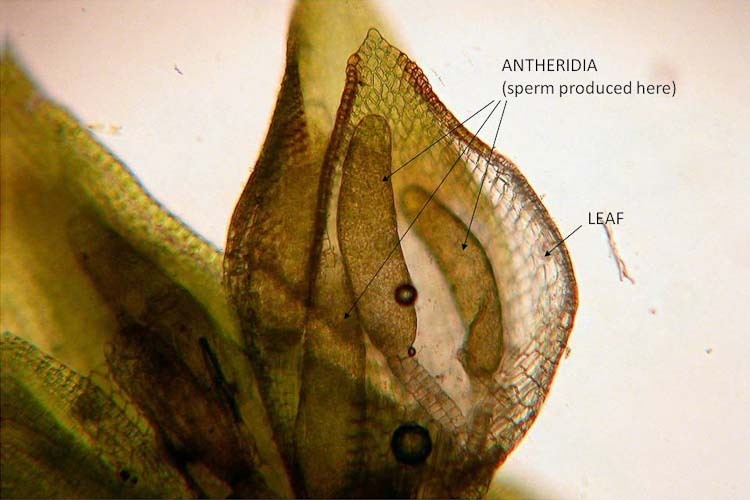 The female ARCHEGONIA are flask-shaped with an opening at the top for sperm to enter and a single EGG (produced by mitosis) inside at the bottom. With the help of a raindrop or simply by swimming through a film of water (some recent research indicates that tiny invertebrates sometimes help spread moss sperm), sperm find their way into an archegonium to fertilize the egg and begin the diploid sporophyte phase of the life cycle. 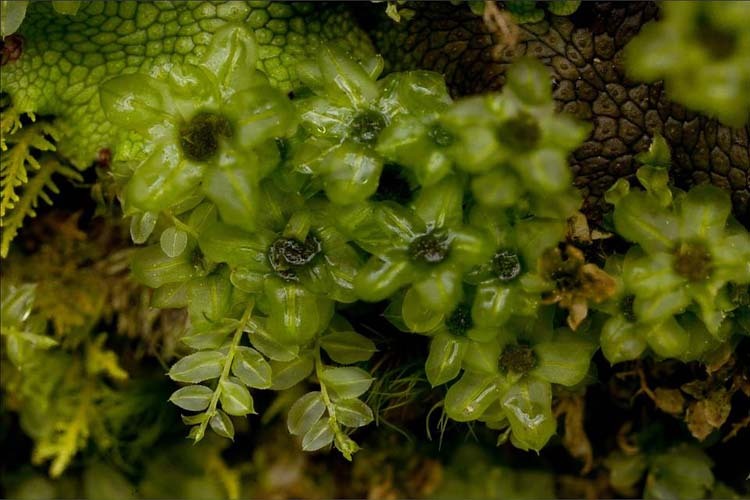 The male plants of some species of mosses have their antheridia clustered and surrounded by a circle of leaves that act as a “splash cup” to enable sperm to be broadcast when the cup is struck by a raindrop. Here are two examples of splash-cup males. 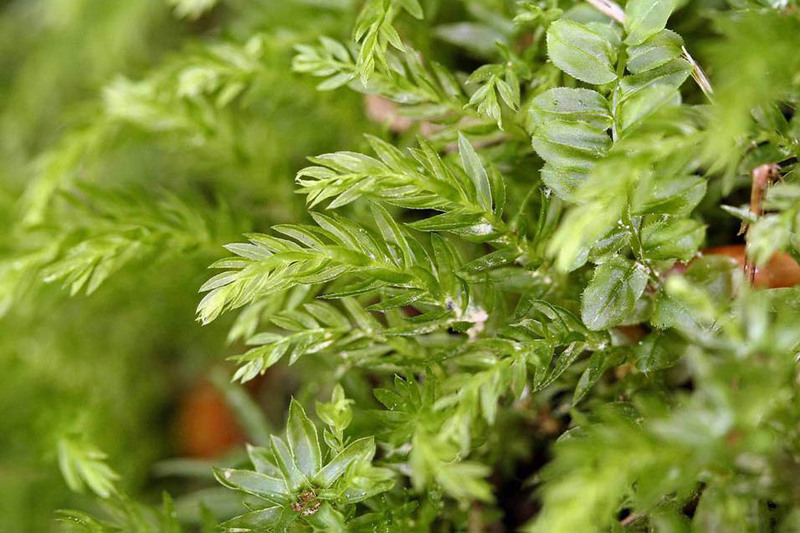 Plagiomnium ciliare is a cushion moss that grows on boulders in shady places. 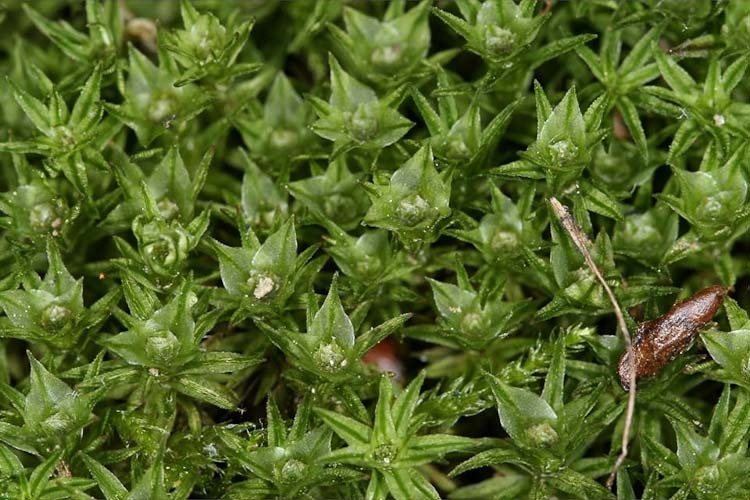 Atrichum angustatum is a cushion moss that grows on newly disturbed soil in open woods. After an egg is fertilized (thus becoming a diploid ZYGOTE) , it develops by mitosis into a multicellular diploid sporophyte. 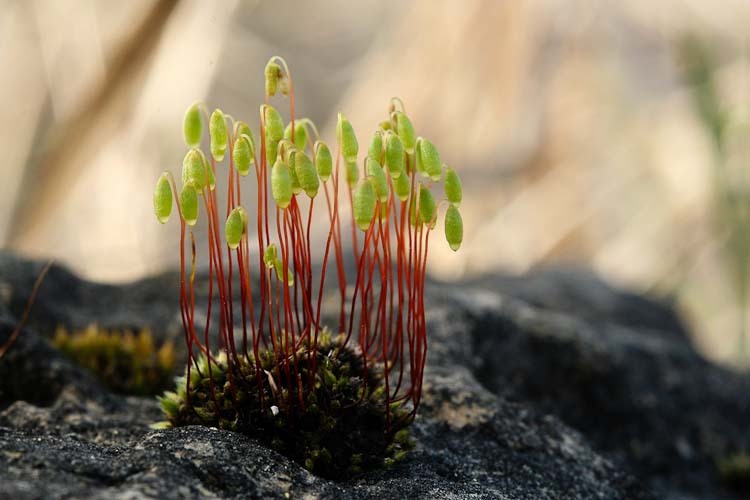 The moss sporophyte is a comparatively simple structure typically resembling a tiny golf club stuck onto the maternal gametophyte that produced it. It remains attached to the maternal gametophyte (“Mom”) for its whole life, deriving most of its nutrition from her. Bryum lisae var. 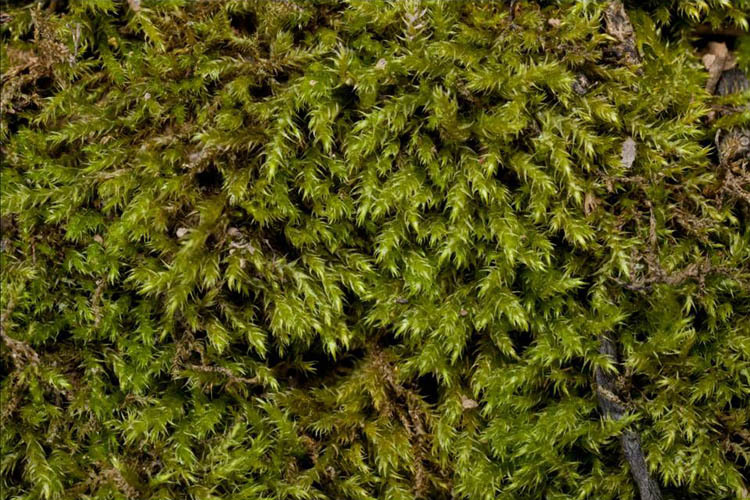 cuspidatum is a cushion moss (acrocarp) with tall sporophytes. The moss sporophyte consists of a SPORANGIUM (“capsule,” within which spores are produced by meiosis) supported by a slender stalk, the SETA. When it is young, the sporophyte is protected by a hat-like covering, the CALYPTRA. The calyptra, composed of maternal gametophyte tissue, is a remnant of the archegonium. Until the spores are mature, the mouth of the capsule is covered by a cap-like lid, the OPERCULUM, which eventually falls off to allow spore release. Spore release is typically regulated by one or two rings of teeth around the mouth of the capsule, the PERISTOME. Entodon cladorrhizans is a carpet moss (pleurocarp) that often develops sporophytes. Sometimes moss sporophytes are quite intricate, bearing two concentric rings of teeth on the peristome. The teeth open and close purely in response to atmospheric humidity (they are the non-living remnants of cell walls), and so enable the release of spores under the correct conditions (usually, but not always, when it is dry). Aulacomnium heterostichum capsules bear two rings of teeth on the peristome. A dark saxicolous (rock-dwelling) moss called Schistidium rivulare is common on old grave markers in rural cemeteries. 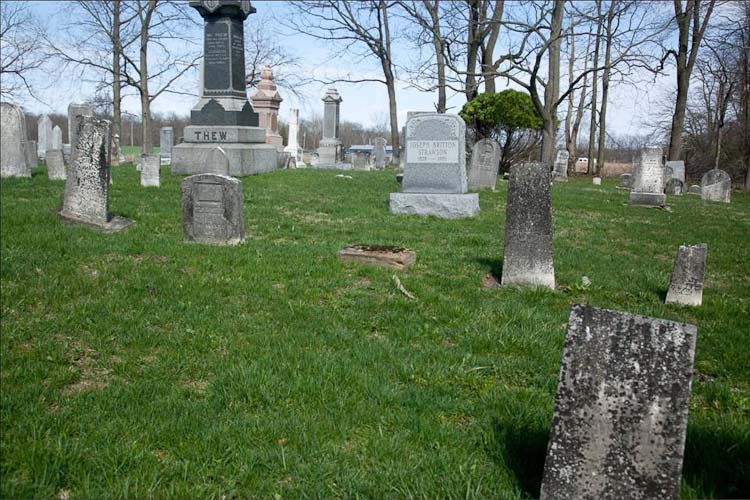 Rural cemeteries are outstanding moss habitats. 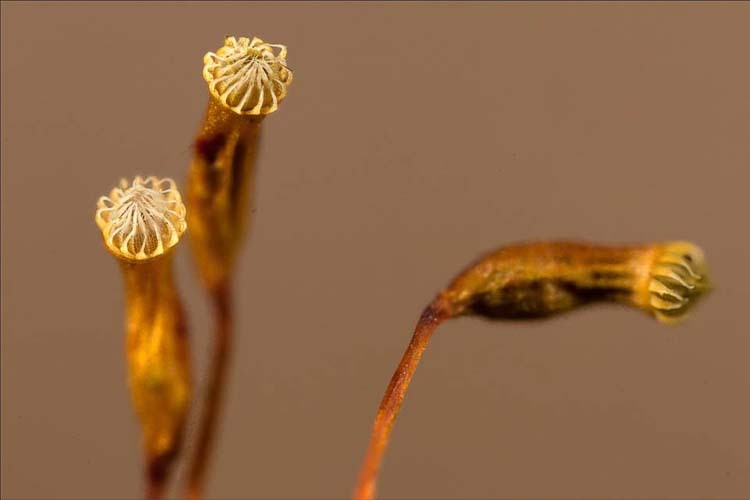 Schistidium rivulare produces sporophytes with such a very short seta that the capsule is immersed in the upper leaves. 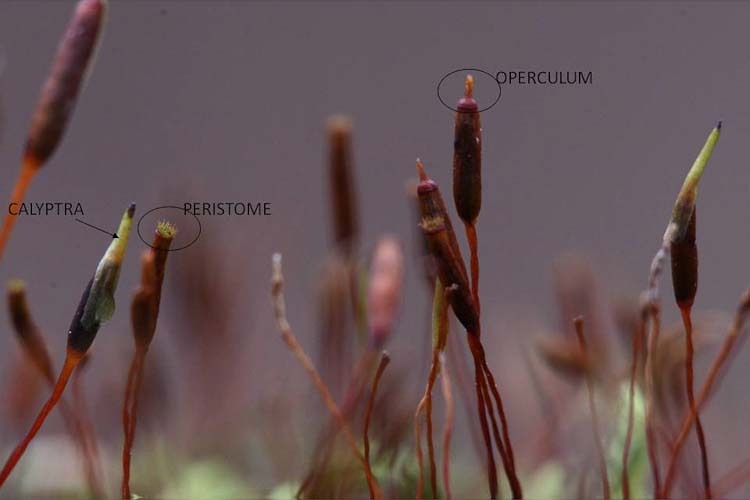 This photo shows the sporophytes in February, while they are still tipped with a calyptra, and closed by the operculum. 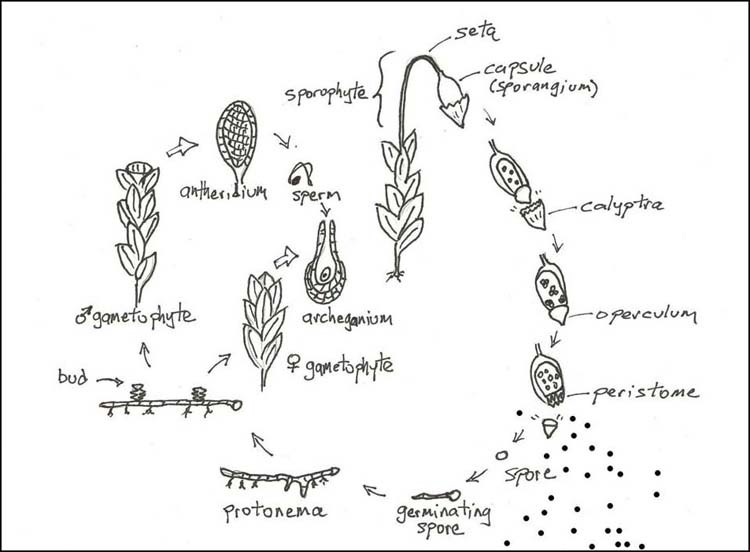 By April, the calyptra and operculum have fallen off each capsule, and the dispersal of spores is regulated by the peristome teeth. 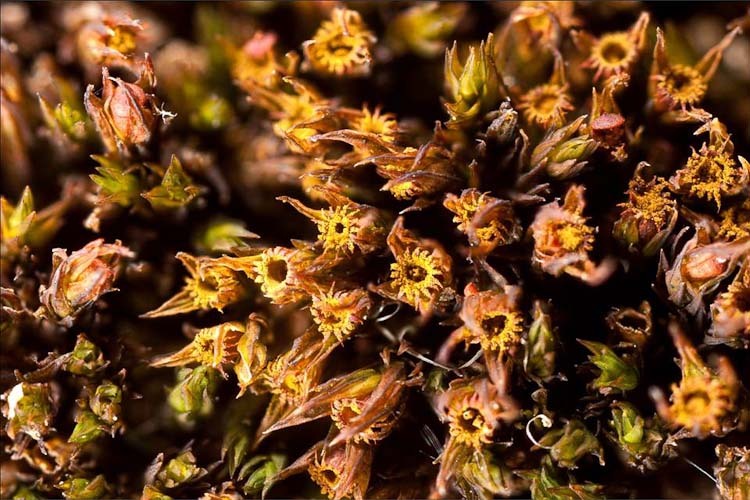 Schistidium rivulare capsules bear a single circle of 16 peristome teeth.